Vic's Pizza loves making pizza lovers smile! Ranked as the "Best" Pizza in Greenville, SC by prestigious Town Magazine, our "Authentic" New York style pizza pies are prepared from scratch using the finest ingredients money can buy, including "Bacio" cheese. 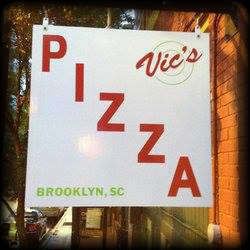 Vic's Pizza is a locally owned family pizzeria located in the heart of downtown Greenville, SC. We invite you and your family to join us for some "Authentic" New York style pizza! Download our Vic's Pizza App for your Cell Phone or Tablet ~ Click Here for the Info !!! Mayor Knox White now has a Special Vic's Pizza Pie named after him! Click Here for the Info !! !